New rules for "hybrid classes" will be written. The Kickstarter community will collaboratively build a haven-city that will be described in detail in the core guidebook. Hi! Thanks for checking out my Kickstarter project for Reclamation—a post-apocalyptic horror RPG where players take on the role of dystopian heroes fighting to “reclaim” the shattered remnants of civilization from a world plagued by radiation and monstrous creatures transformed by the nuclear fallout. Once published, Reclamation will be around 250 B&W pages of pure dystopian action, suspense, and intrigue! I realize that “color” pages are more desirable, but that would literally increase the price of the game from somewhere in the $20-30 range to $75-80. 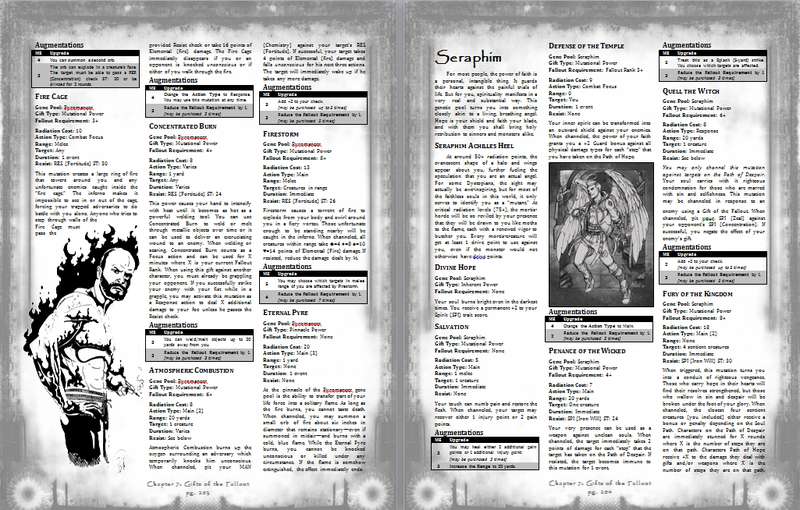 Besides, I personally believe that the B&W look complements the dark setting of this role-playing game. The money received from your pledges will of course be used to produce your custom deliverables, but they will also go towards paying artists to complete the giant order of pictures that I need to complete this 7-year project of mine. In addition to the other pledge awards, I will also let you know which pictures were “adopted” thanks to your pledges! Here are a couple screenshots. Once again, the book is written; I just need help with printing and the cost of artwork. For more information about me or Reclamation, check out my blog at www.architectgames.wordpress.com. Here are a few "selling points" for Reclamation. This is admittedly pointed towards gamers with experience with other RPGs. Homegrown ACE System – The ACE (All Creative Exceptions) system that I have developed is unlike any other RPG on the market; it is the creative culmination of 15+ years of rocking out RPGs nerd-style! 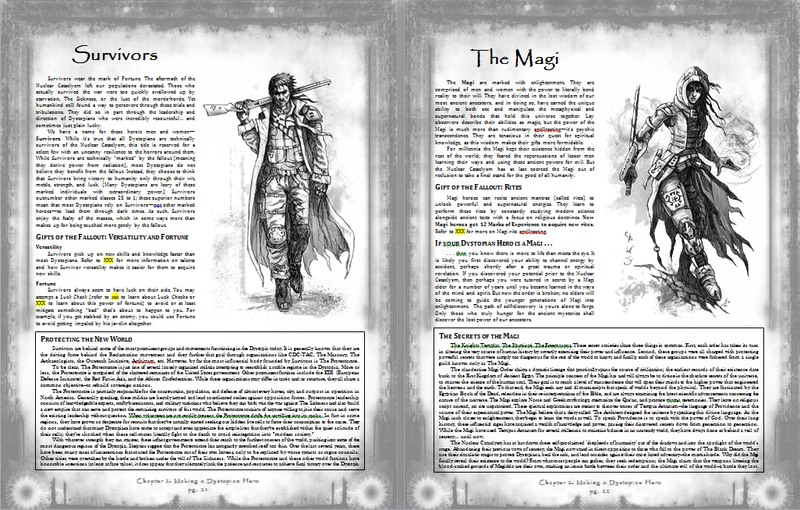 In Reclamation, players typically work in cooperation with the main storyteller (called the FateDealer) to create new rules on the fly using the guidelines outlined in the book. The ACE system means anything is possible and everyone has a say in the action. The focus is placed on your creativity and the unfolding story, not the rules. Dice-less Gaming – No dice are used in Reclamation. ::gasp:: I know, right?! Instead, each player has a 52-card playing deck (called the Fate Deck) that's used to resolve all action in the game. Reclamation takes advantage of several unique gaming elements that cards offer over dice, and as you'll come to find out, it speeds up the action of the game immensely! Unique Settings & Themes – While the overarching backdrop of every Reclamation adventure is a post-apocalyptic earth, Reclamation gives you creative control to sculpt this dystopian world in any way you desire. There are blasted wastelands, verdant jungles, underwater cities, mountaintop settlements, and city ruins galore! There are survivor packs daily threatened by the mortis-horde and sprawling havens where greed, politics, and betrayal are the greatest threats to humanity. There are degenerated zombies, mutated creatures, zealous cults and cannibal tribes. There are entire regions that have fallen into an almost medieval dark age while others have been built up with futuristic technology. So whether you want to explore uncharted lands, build new societies from the ground up, or play out a game of true survival horror, Reclamation has everything you need to live out almost every conceivable kind of adventure. Endless Character Customization – Close your eyes and picture your ideal character. Got it? Now open the pages of Reclamation and create him or her! Reclamation offers a flexible Trait/Talent system alongside hundreds of special powers that include everything but the kitchen sink--sorcery, bio-technology, wild mutations, divine providence, personal perfection, etc. Now that I think about it, your character could actually use psychic powers to throw in the kitchen sink too! Reclamation offers a robust character generation system that ensures that no two dystopian heroes are alike! Anything Goes Combat – Reclamation introduces a truly unique and fast-paced combat system that lets players have absolute control over how they attack enemies and how they respond to being attacked themselves. Players are asked to describe how they strike an enemies; this isn’t just for storytelling purposes—it can actually get factored into the result of their attacks. Since this is a post-apocalyptic world, it’s also unlikely that you will be well-equipped with Kevlar vests and rocket launchers and giant broadswords. While all of those things exist, Reclamation includes rules to make ANYTHING into combat gear: golf clubs, cable modems, PVC pipes, hockey helmets. To survive the Dystopia, you’ll need ingenuity to turn junk into powerful weapons and armors! If you have actually read this far... THANK YOU! I am truly appreciative of your time and interest in this project of mine. It has taken me seven years to put this game together, but I am truly proud of what I have accomplished with Reclamation. Please feel free to contact me with questions, concerns, or ideas! I made this game not to make a lot of money (because there isn't a lot of money in this market), but because this is something I love and am passionate about. This Kickstarter project affords me the opportunity to share my creative vision with others, and that means more to me than just about anything!